March Madness can create confusion for us when it comes to making the best team selections. Making selections for the best digital marketing tools to use for your small business or nonprofit can be a really confusing process as well. It’s hard to know what tools will be the right fit for you and your team. 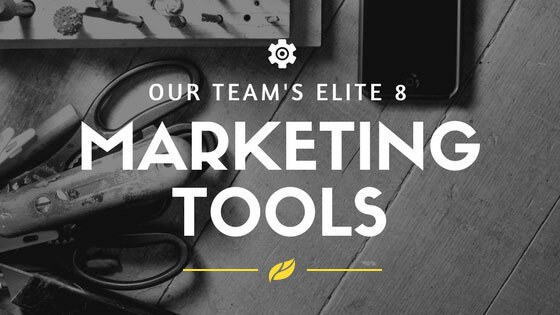 Maybe this was the year that you wanted to make some changes to your internal marketing toolkit, but it’s March and other things have taken a precedent. With small businesses and nonprofits in mind, our team compiled a list of our favorite design, marketing, and productivity tools that help us get the job done. The majority of these tools are inexpensive or free to purchase and don’t have a high learning curve in order to use them effectively. Adobe Creative Suite: There are lots of fantastic user-friendly programs for design. But what’s that best? When it comes to design and layout, Adobe has it covered. With all their different programs, the sky’s the limit! That’s why it’s a designer’s number one choice for creative freedom. The only downside is that there is a learning curve; you probably won’t be able to just open a program and know what to do without some coaching. However, if you have the time to learn some of the programs, you’ll be glad you did. Canva: If you’re not an experienced designer, then Canva is an awesome tool for amateur (and wannabe) graphic designers. The simple templates and easy navigation give users a chance to explore techniques without all the overwhelming options of more advanced systems. Lynda: For those of you who don’t necessarily have the ability to hire outside help to accomplish some of your marketing objectives, Lynda is the perfect tool! This website hosts an endless number of tutorial videos on tons of different subjects: from animation and architecture to photography and podcasts. The online courses are led by some of the field’s most successful leaders, providing step by step instructions and encouragement. Wunderlist: I’d have to say that my ultimate organizational favorite would be Wunderlist—when I have a fleeting thought on a task or detail that I need to remember, I can quickly add it to the list, set a reminder or due date, and forget it. Too many details swirling in my head begs for me to forget some, so Wunderlist actually becomes my second brain! Slack: Slack is another favorite productivity tool of mine. We use Slack almost exclusively for internal team communication. It’s cut down on the number of emails being sent and allows for us to bring together all the people and pieces we need to collaborate on client projects. Slack recently introduced Threaded messaging, which allows for the right members of our team to have side conversations on content that’s posted without clogging up our Slack Channel’s main feed. The organizational geek in me is loving that feature! Google Analytics: We consistently report on how our digital marketing services are impacting the main KPIs for each of our client’s businesses. BUT it can be time consuming. Google Analytics makes it easy for us to analyze website performance and traffic as well as keep an eye on how social media marketing is impacting a client’s website. Google Analytics allows you to automate your reporting with the Spreadsheets Add-on, so the right data is automatically moved into a spreadsheet that can be easily shared. You can also schedule reports to be emailed to specific people within your organization right from the Google Analytics dashboard. Rafflecopter: Contests and giveaways can be used in so many different ways to give back and significantly grow your online communities. In my opinion, Rafflecopter is the gold standard for giveaways. I love that it’s built in a way to keep everything about the giveaway organized for you, so you can view not only the giveaway details, but also the giveaway entries and stats, all in one place. It will even randomly select the winner for you!